I use GoDaddy.com for most of the domain names that I own. GoDaddy is not great but I have been using them for over a decade and it’s too much of a hassle to change all of my domains to another provider. This morning I was a bit annoyed with them when I received a number of emails with a reminder about activating my domains. I didn’t buy any domains recently and I also didn’t receive any other mails from them about activating domains, so I assumed they were trying to upsell me something and I didn’t open the emails. GoDaddy is good at upselling, when you buy or renew domains you need to read the screens during their check out process carefully, otherwise you may end up with a lot more than you had wanted to buy. Because I don’t live in China I was worried that I would need to find someone to register the domain names on my behalf. But luckily for me they also accept ID copies from a few selected other countries (HK, Taiwan, Singapore, Australia, USA and Canada), so I sent GoDaddy a copy of my Canadian ID. GoDaddy warned that they will share this information with the Chinese government, but what can you do? Among others this blog uses a Chinese domain name (marc.cn) and I don’t want to lose it. I was just wondering, suppose someone living in Europe would own a bunch of .cn domain names, would this person all of a sudden lose control of his domain names because European IDs are not accepted by GoDaddy? It seems that will be the case. 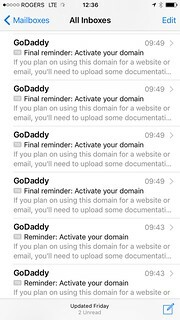 I am a bit annoyed by this whole thing, GoDaddy should have at least given its users an advance warning, and not send a reminder (which was actually a first notice and not a real reminder) and a final reminder within minutes of each other. I would not be surprised if they suddenly received a warning from China and after that immediately implemented the policy. After reading the mails I was a bit worried that I had lost access to my blog already (the email literally said that marc.cn was not activated yet and so I could not use it for hosting a site! ), but that was not the case. However, I wonder if I now need to start self-censoring my blog posts? Can China just take my domain away if they want to? I am not too worried about that, but find it all a bit strange. Maybe it’s time to start making a back-up of this blog on one of my other domains. Chinese spring will not turn into summer. China is moving away from slowly giving more freedom back to total control. See what’s happening in HK. If China continues down this road it would not be very beneficial for its people and the rest of the world. Hi Marc, I will try to give you a few answers. No they won’t be able to take your domain away. They will be able to block access to it from China and they will also be able to ask GoDaddy to kick you off their server. Maybe it’s time to start making a back-up of this blog. You should always make backups that has nothing to do with the threat that China can take your blog down. Just like you regularly update your WP version and your plugins, you should also regularly backup your database (read: all your blog posts) and the wp-content folder that contains your theme, the plugins and…uploads (read: all photos you added to content). You might want to have a look at my Support site where I offer these services (linked from my name). Whats the latest on this matter? I managed to get the Chinese domain name certificates through GoDaddy with my Canadian ID. Just found your blog and really enjoy the entries I’ve read so far. On the subject of VR which is one I follow quite closely. . I recommend reading “Ready Player One”. . which is actually required reading for anybody at FACEBOOK involved in VR. Spielberg will make a film based on the novel. It depicts dystopia where people are usually immersed in VR. Novels like these often influence the direction the tech takes. It’s good to start self censoring your posts. You should also review posts you put up before that might have pissed people off. You never know who knows who in China, and you made some unnecessary enemies there. You might want to delete a few entries, being served a writ upon landing in China because someone’s tagged your arrival with the authorities won’t be much fun. They just did this to me. Freezing my hosting without warning and giving me 48 hours to prove who I am. I am Canadian in China and bought .com domain names that have nothing to do with China. I am quite pissed off and told them so accusing them of being shills for the CCP.